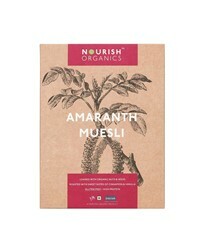 Organic Certified | Organic Amaranth is a power-packed super-food,amazingly high in protein and antioxidants. Organic Certified | Lean Muesli is unprocessed,unrefined, and completely whole & natural! With a delicious mix of popped amaranth, fruits, nuts and seeds. Organic Certified | Amla Bar These delicious bars are an antioxidant powerhouse thanks to the star ingredient -amla! Organic Certified | Apricot Bar Wonderfully sweet dried apricots are the base of these simple but oh-so- good bars. Organic Certified | Breakfast Oat Cookies A filling bowl of oatmeal is one of the healthiest ways to start the day. Organic Certified | Oats Cranberry Cookies Tart cranberries add a sweet touch to these special cookies. Organic Certified |Honey Roasted Almonds Heart healthy roasted almonds get a sweet treatment with a touch of golden honey! Organic Certified | Honey Roasted Cashews A sweet dollop of honey makes our roasted cashews so delicious!